Watching Season 1 episodes with the knowledge of what the show was going to become can often blur out just how well formed many of the show’s ideas were, even before the voices and the animation had developed. Burns, and the palatial estate on which he lives, illustrate that well. “There’s No Disgrace Like Home” is the first time we get to see Burns Manor, and while it would be revised and updated in Season 2 and later, the fundamental ideas of it are all right here. The image at the top of this post is the establishing shot, and right away we know that a) it’s luxurious to the point of absurdity (note the string music in the background when the family walks in), and b) the Simpsons (and by extension, you) are not the least bit welcome. 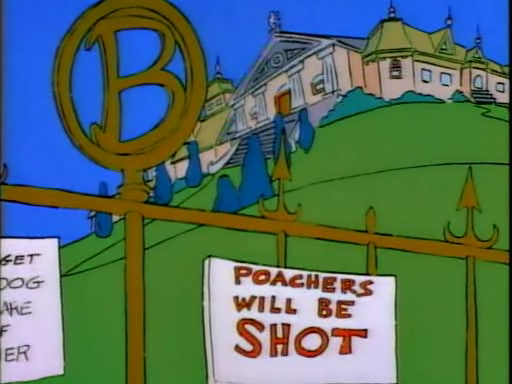 On only one day per year does Burns allow regular people into his perfect world (the warning sign doesn’t say that “Trespassers” will be shot, it says “Poachers”), and even then it’s only so his employees can bow and scrape before him. The sack race is mandatory (and Burns must be allowed to win), the father whose kid didn’t want to be there is not only getting promptly ejected from the party, he’s being fired permanently. It’s got a foyer worthy of Versailles, classical architecture, and enormous grounds decorated with fountains and gazebos. Unlike Springfield, which is kind of a mess, Burns Manor is polished and perfect. We’re still years away from Bart having the train that disappears for hours and one time came back with snow on it, or the band shell where a captive Tom Jones performs for Marge and Homer, or the guards who sing that all they own they owe, but Burns Manor is already recognizable as a place that is both very rich and very cruel. 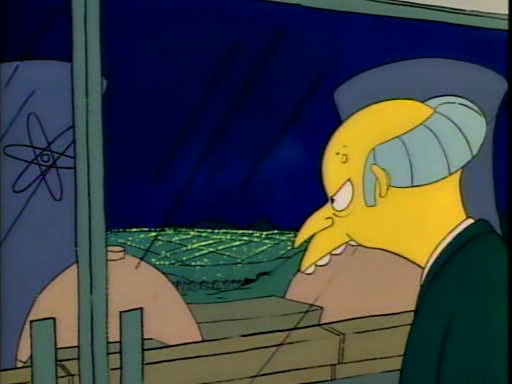 Moreover, it’s already a place that highlights all the things the Simpsons don’t have, and really can never have. 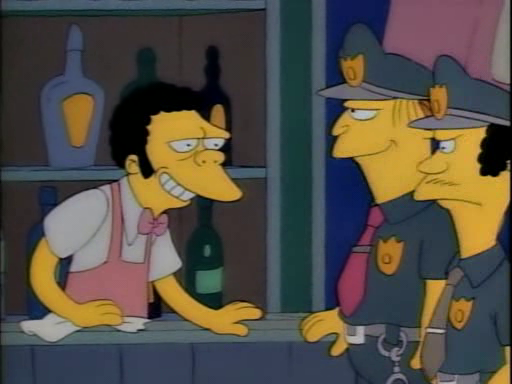 Homer’s place is at Moe’s with the passed out drunk on the bar; Marge has the house that Bart describes as a “dump” when he thinks its someone else’s. Even the perfect family Homer sees leaving Burns Manor at the beginning is stuck at Dr. Marvin Monroe’s run down clinic. Burns Manor, on the other hand, stands literally up on a hill, looking down on them all.